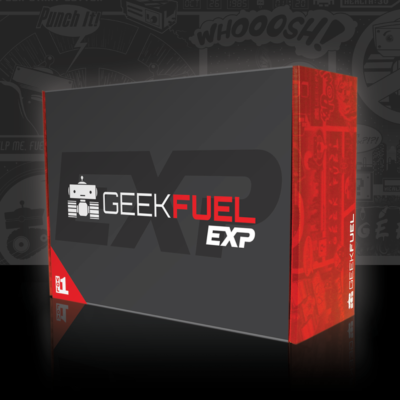 Geek Fuel EXP is the new quarterly version of Geek Fuel. 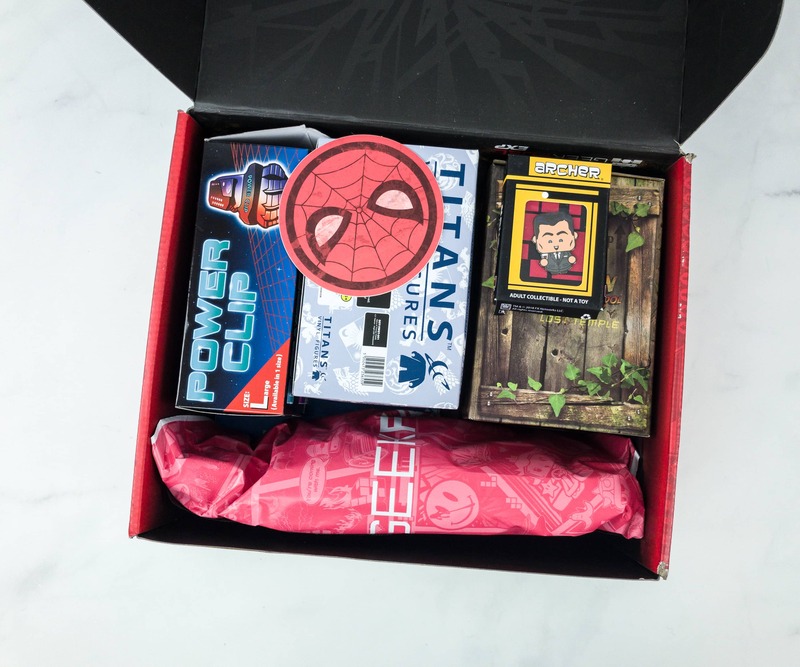 This box is filled with geek accessories and apparel with exclusive games, toys, gear, collectibles, and all things epic with at least $100 in value. 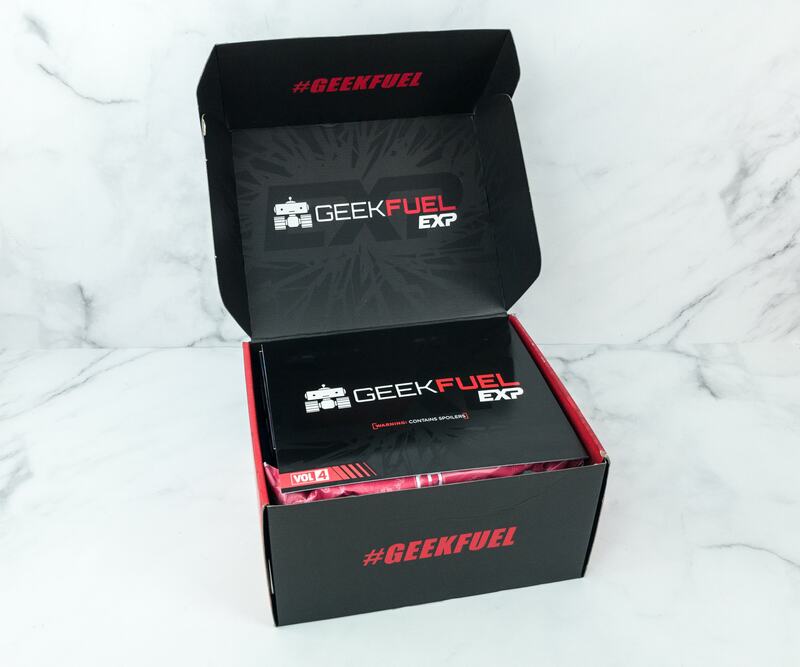 This box always includes a Steam game code and costs $57 + $8 shipping per quarter. See more info on this move here. I am so excited to unbox this! 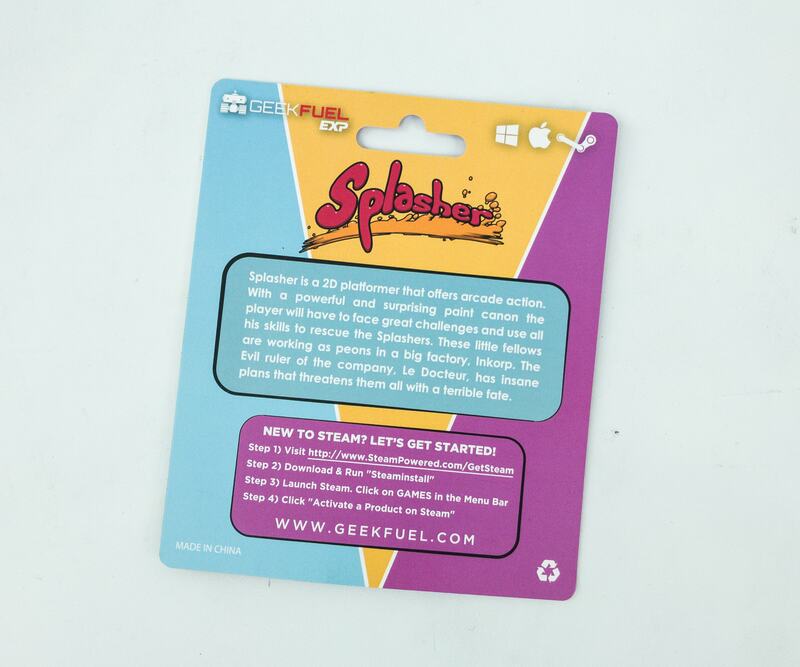 Every box includes an info card, and I’m warning you, it contains SPOILERS! It has a rundown of all the items in the box. 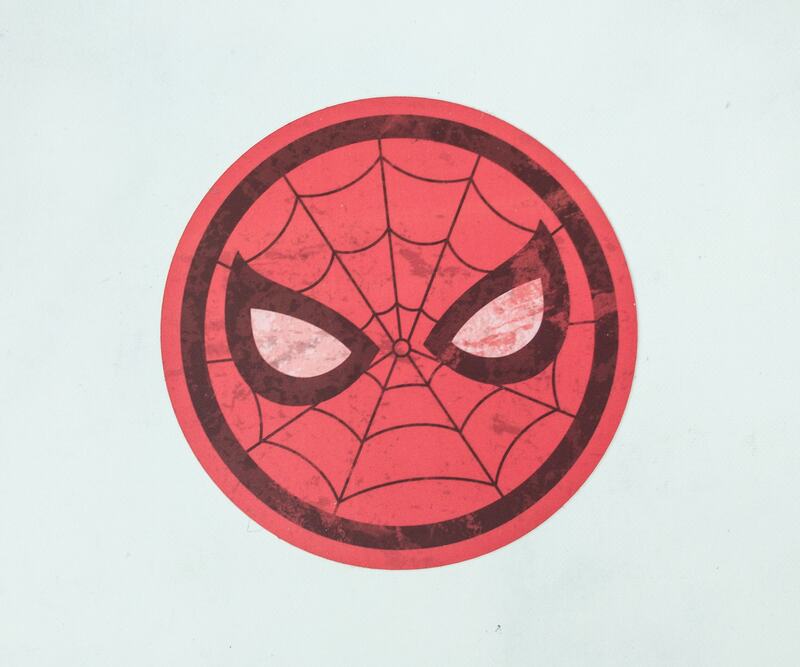 Spidey Sticker. This Spiderman-inspired sticker sticks really well on flat surfaces. It’s perfect for laptops, notebooks, or anywhere you want to see him! Splasher Steam Game. 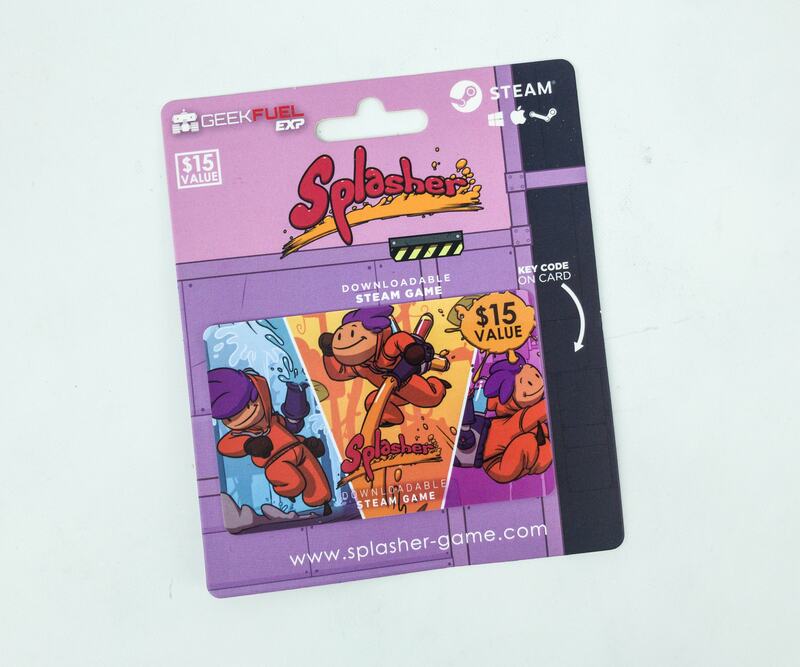 They also included a Steam Game that I’m sure that will get me hooked, Splasher! The game is full of fun and humor! You just need to save your companions, the Splashers, from the Inkorp Megafactory with the use of your paint cannon! It can work on Windows, MAC OS, or even SteamOS + Linux! 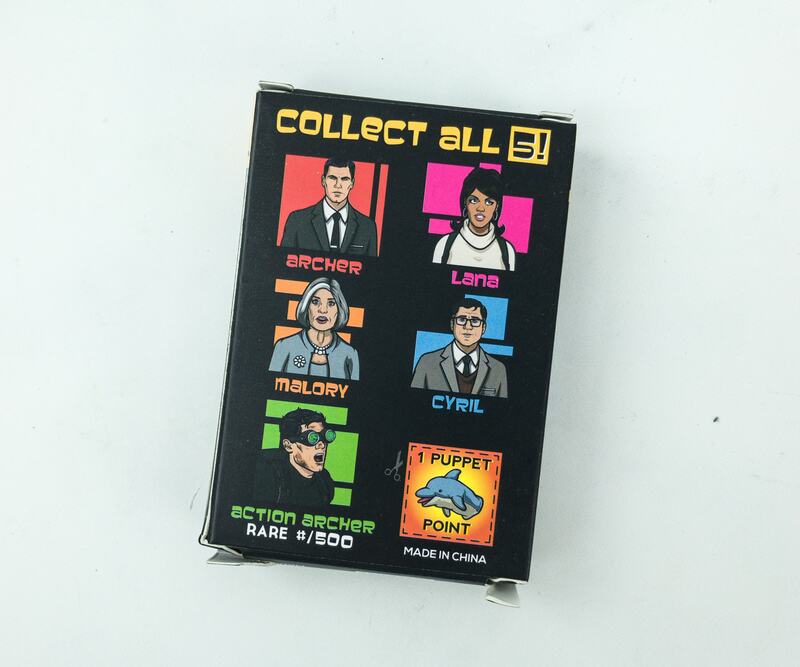 Archer Pin Palz Edition. 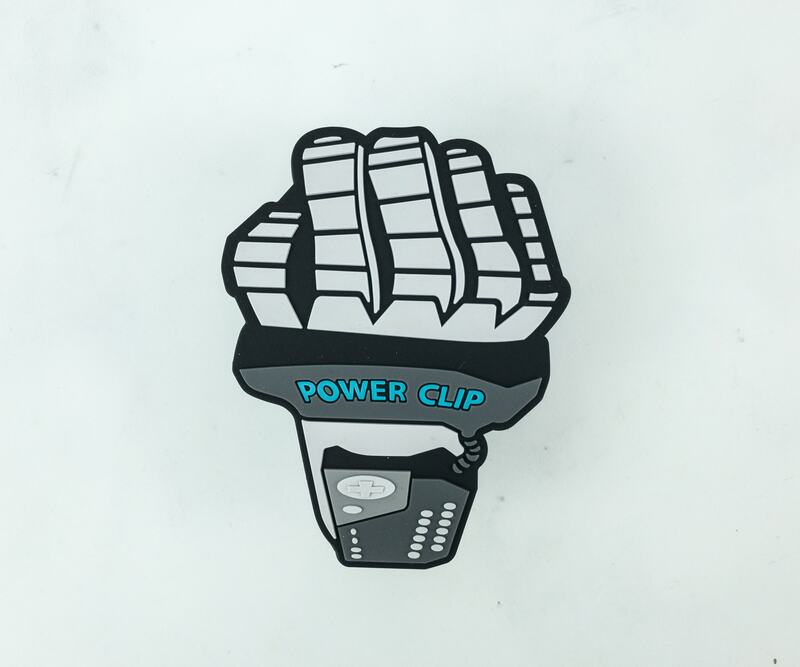 Pin Palz are taking pins up a notch. 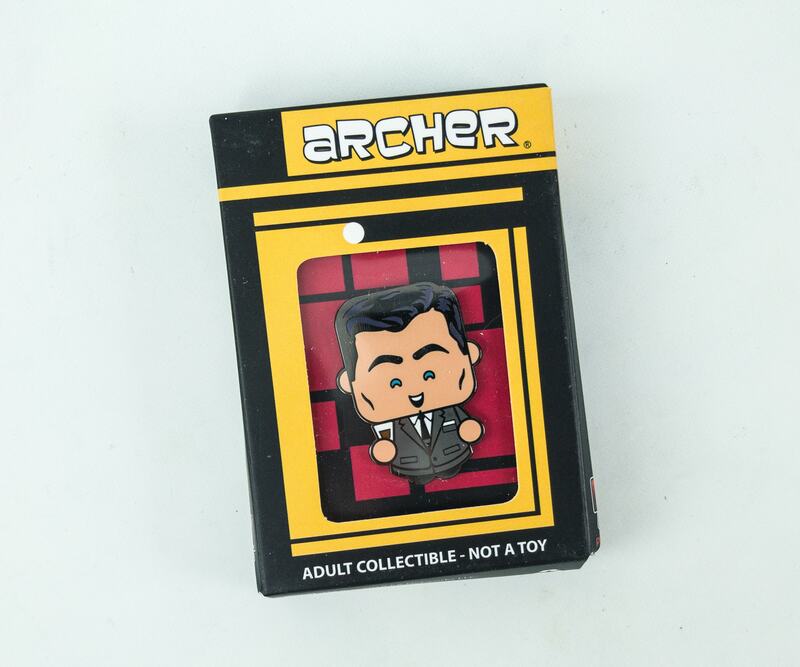 In this box, they included a version for the cool characters of the adult animated sitcom Archer. Aside from Archer, you can also get Lana, Malory, Cyril, or even a rare action Archer which only has 500 pieces produced! 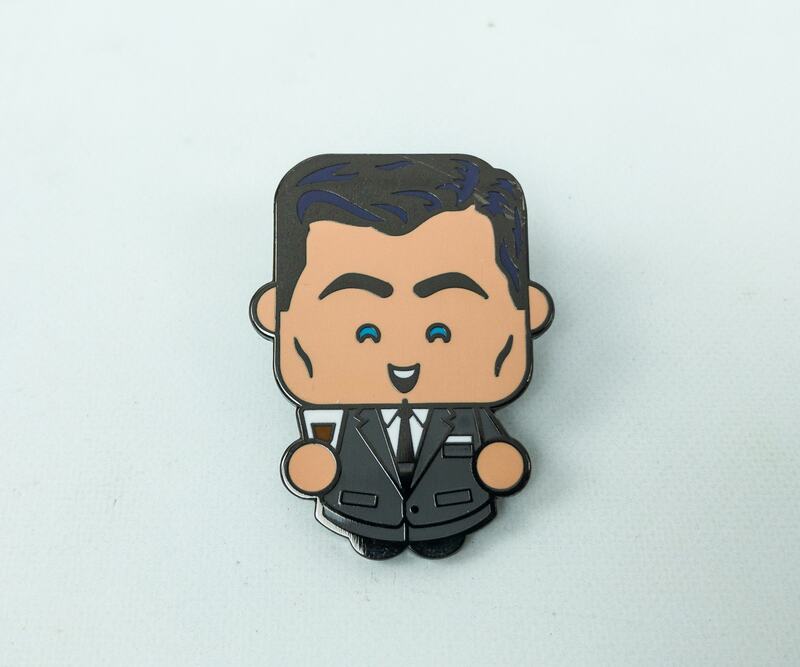 Fresh from the International Secret Intelligence Service is this fun-loving secret agent, Sterling Archer. He may be a dysfunctional agent but with his fun nature, you’ll want to grab some drinks with him! 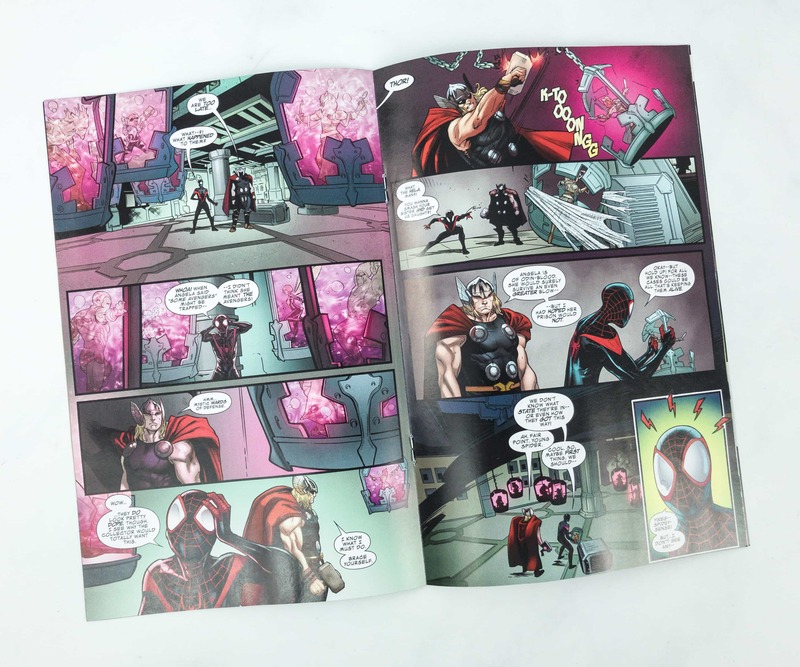 Spiderman and Thor Marvel Team-Up Custom Edition #1. 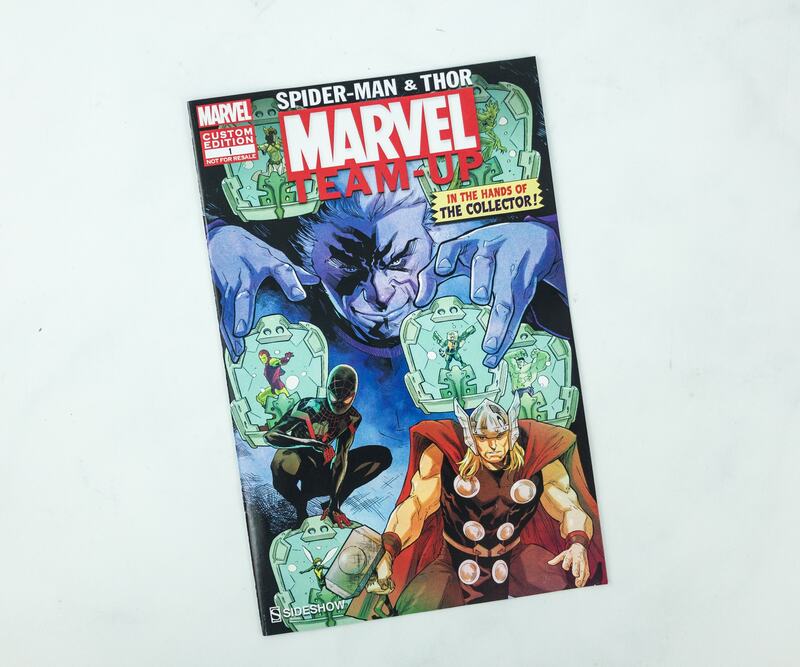 Usually, Marvel Heroes love teaming up and here, we got the God of Thunder building his alliance with the web-slinger! 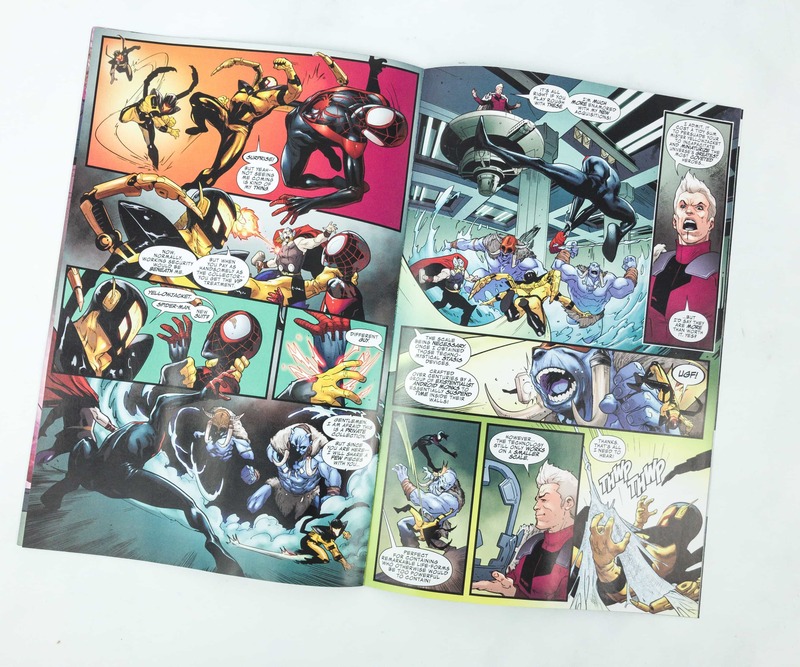 I am loving the colors and gloss of the pages on this comic! Both heroes are under the hands of the Collector and I am so excited to know how things will turn out! Spider-Man Kid-Arachnid T-Shirt. 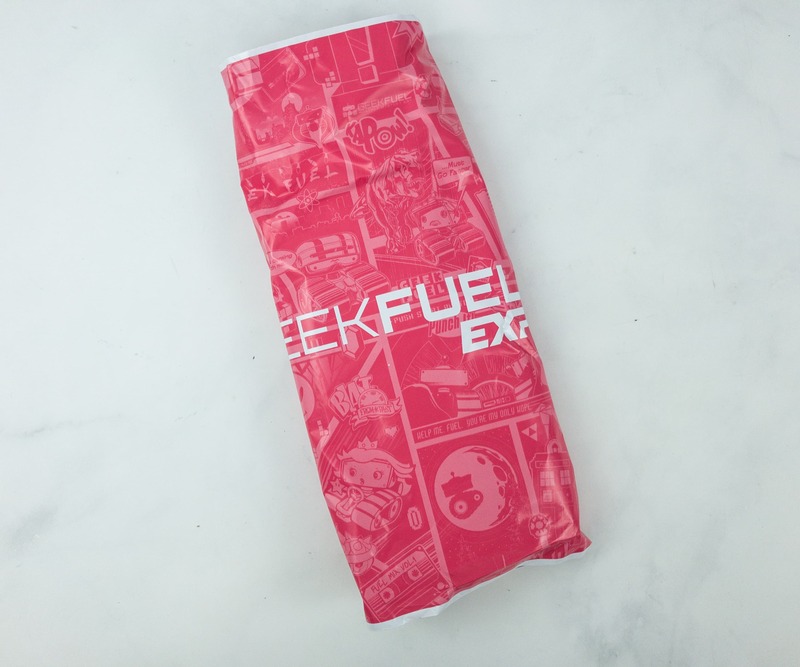 The next item is packed in a cute red Geek Fuel-printed polybag. 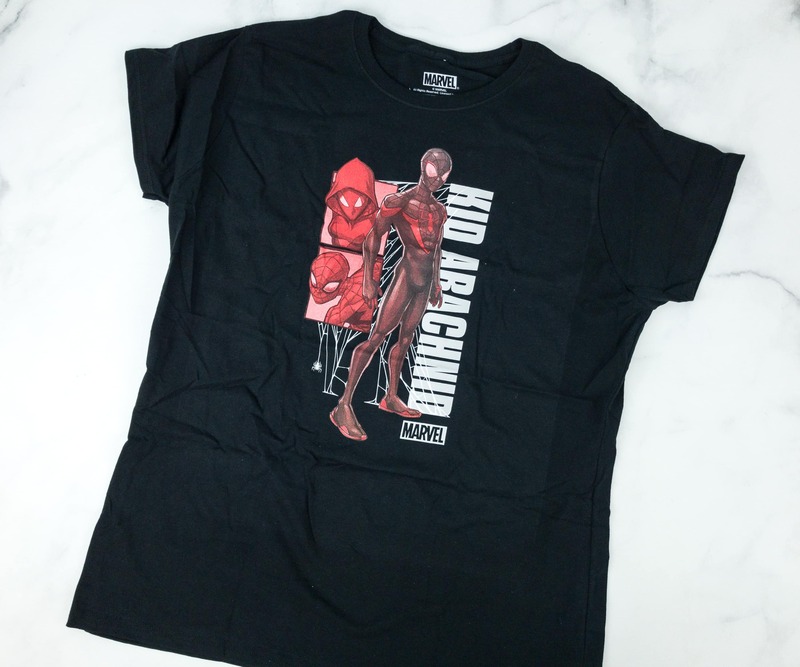 It’s a geeky shirt featuring Kid Arachnid, also known as his alter ego Miles Morales, who exists in an alternate universe! 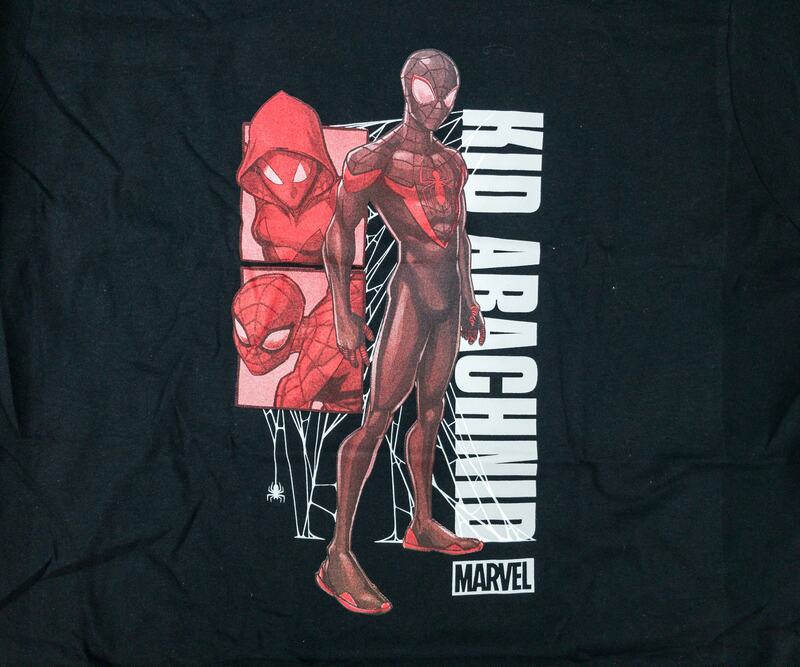 Unlike the universe’s Spidey with a blue and red suit, Kid Arachnid dons a black suit with some red on it and a spider is drawn on the front center. He used the name Kid Arachnid when he lives on the original universe to not confuse the original superhero with him. It’s a black shirt so I am happy about it, and the fit is fantastic too! 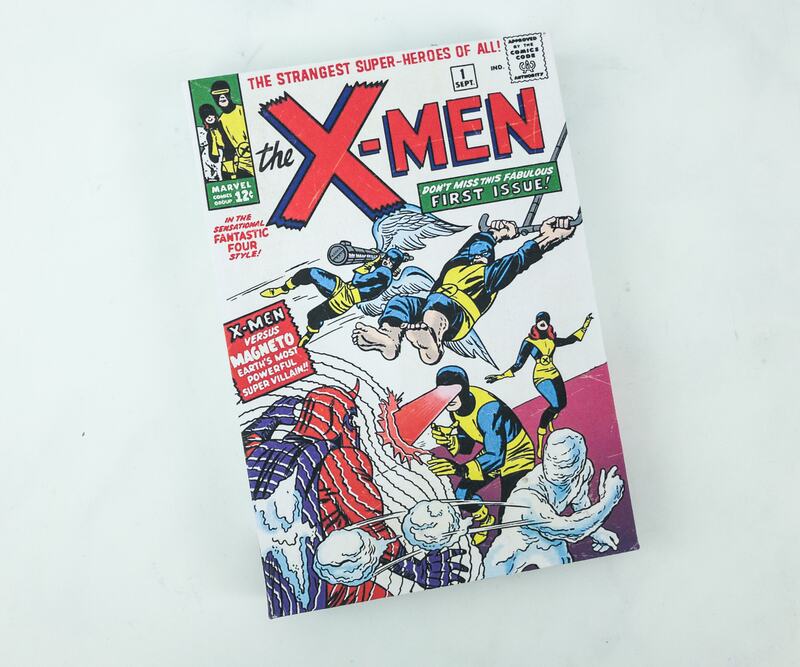 The X-Men #1 Classic Canvas Art Silver Age Edition. 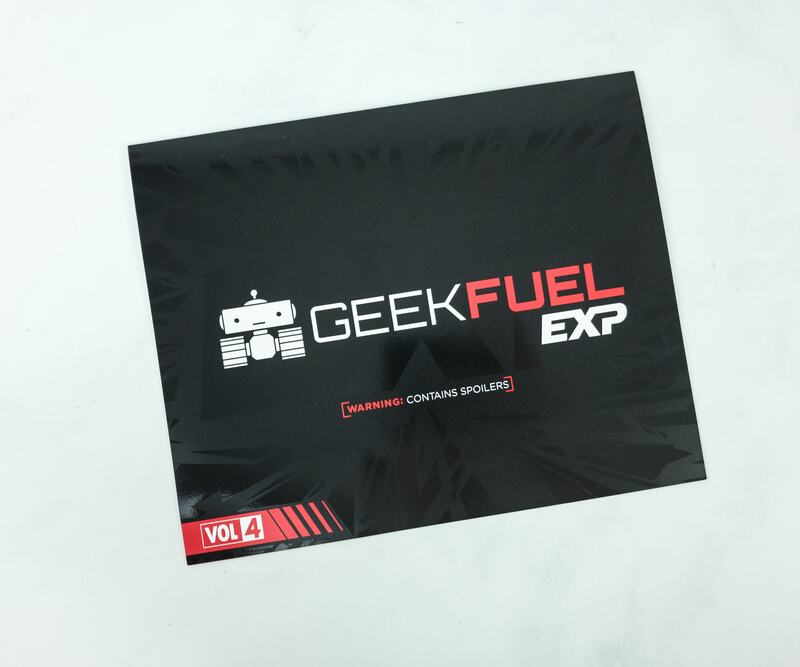 Every Geek Fuel EXP box will contain a canvas art. 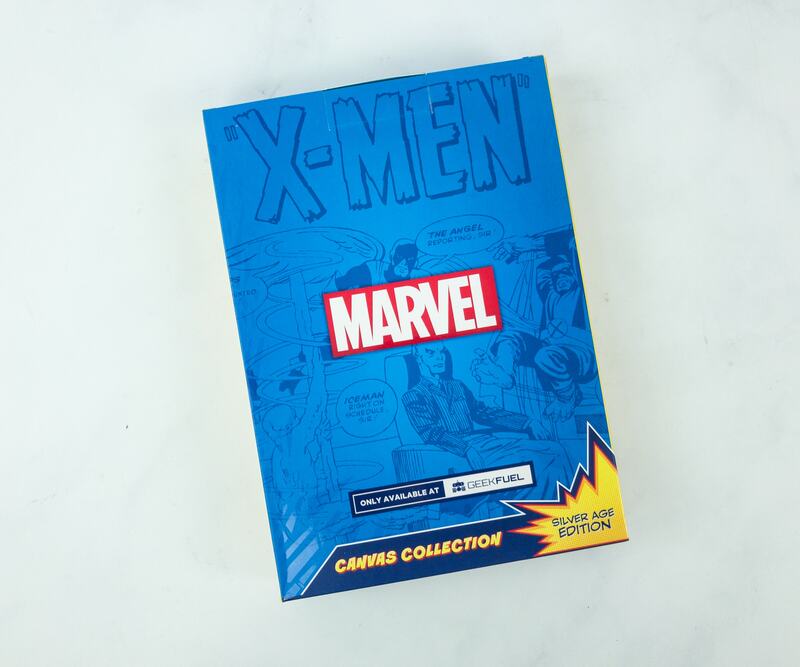 For this one, I got the X-Men #1 classic Silver Age Edition and I am too excited to take it out of its container! The comic was published in 1963. Its cover features some of the well-known mutants fighting Magneto! This item is as iconic as the series itself and I’m glad to have it! My wall is ready for more canvas arts! 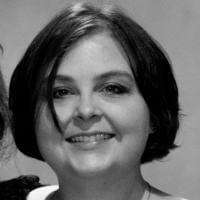 The art is supported by a wooden frame and the canvas is securely stapled at the back. 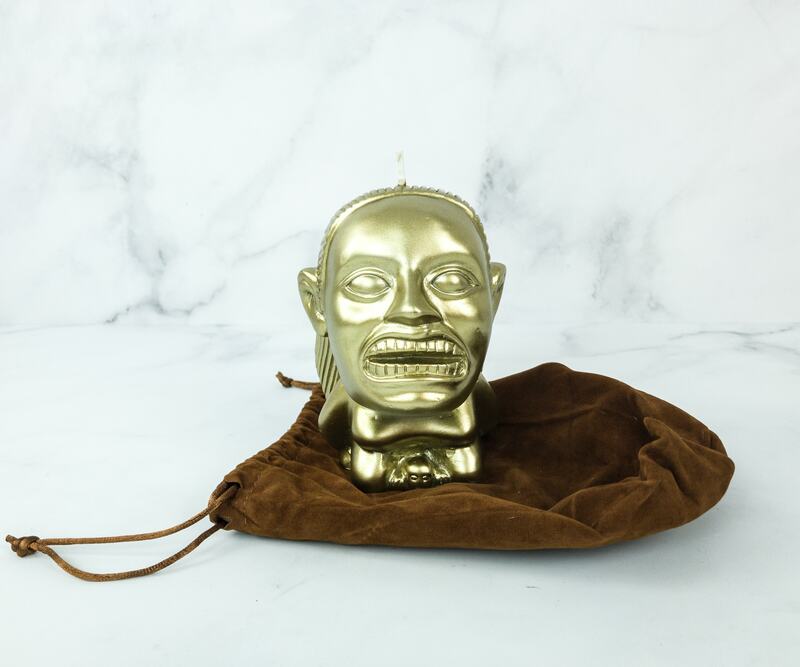 Golden Fertility Idol of the Lost Temple Candle & Drawstring Pouch. 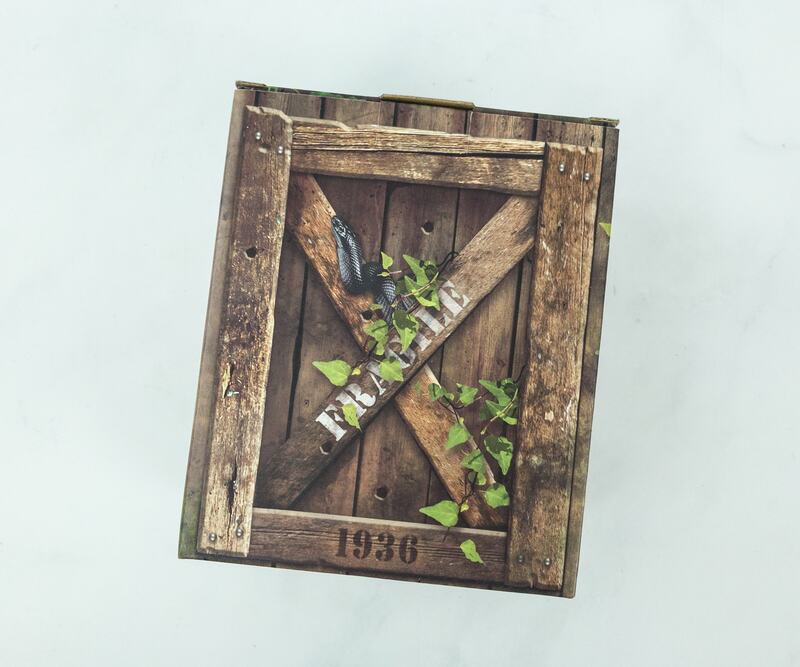 I was amazed when I found this box and I know it contains something precious! That box art is superb! 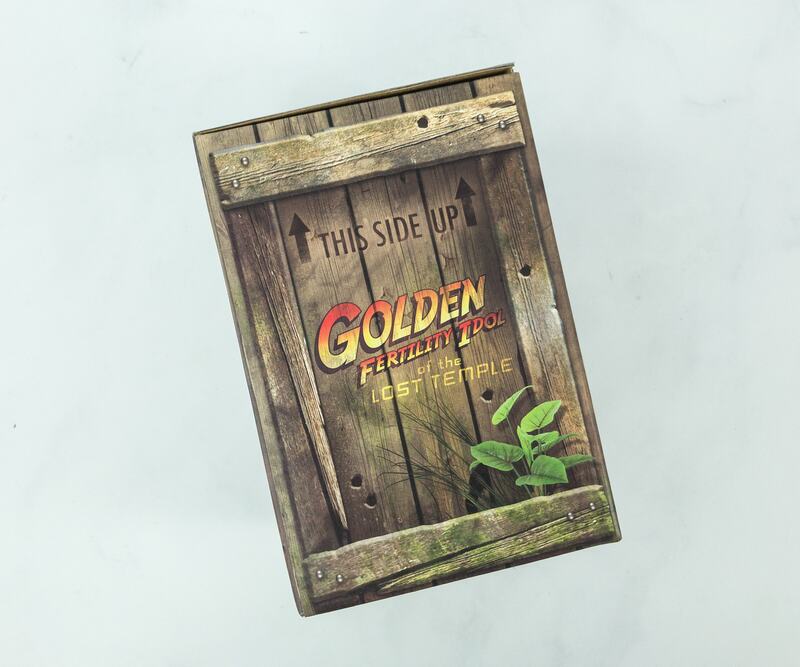 I love how they made the box look like the real thing, I almost screamed when I saw that snake on there! 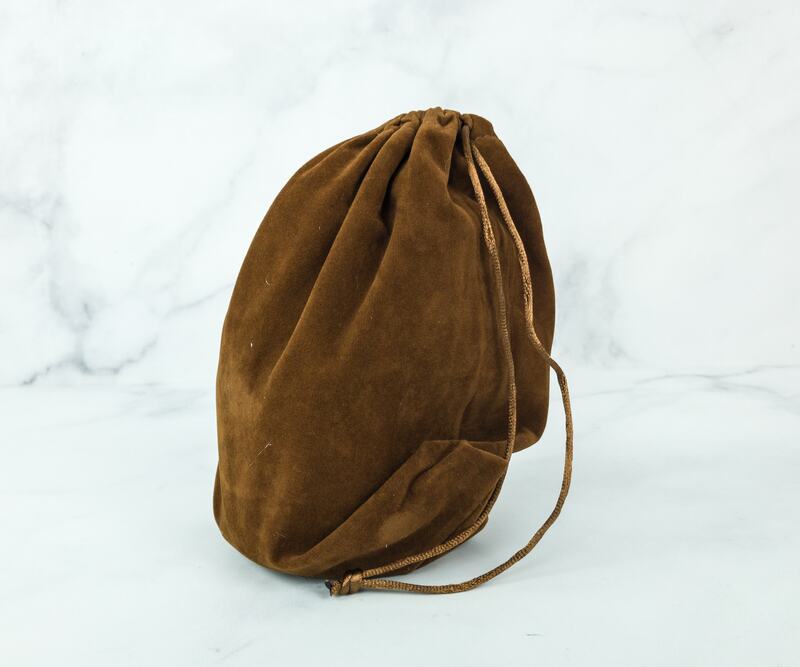 The treasure is contained on this brown drawstring pouch. I can tell that it contains something beautiful and precious with the way they packaged the whole thing! Yes, it is indeed very unique! 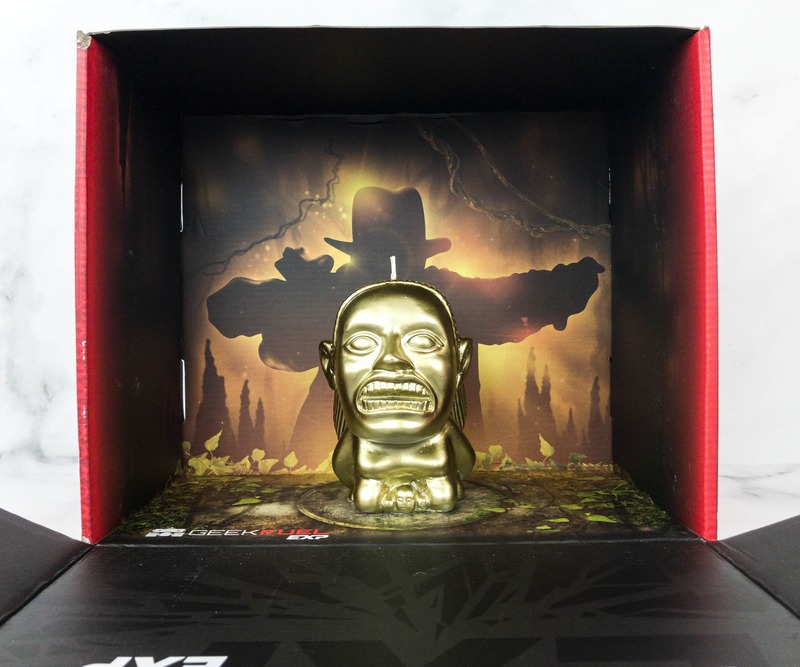 It’s the golden Fertility idol, which is an artifact that appears in the opening sequence of the Indiana Jones Raiders of the Lost Ark. Feel old yet? That was released in 1981, yet it still remains fresh in our minds! This will look good on my center table, I just hope nobody will try to fill the pouch with sand and replace my idol with it! Kudos to those who made this replica, it really looks like the one on the movie and the idol looks like it’s made of shiny solid gold, not wax! The Geek Fuel Box will serve as a good altar for this idol too. This reminds me of the scene on the video! 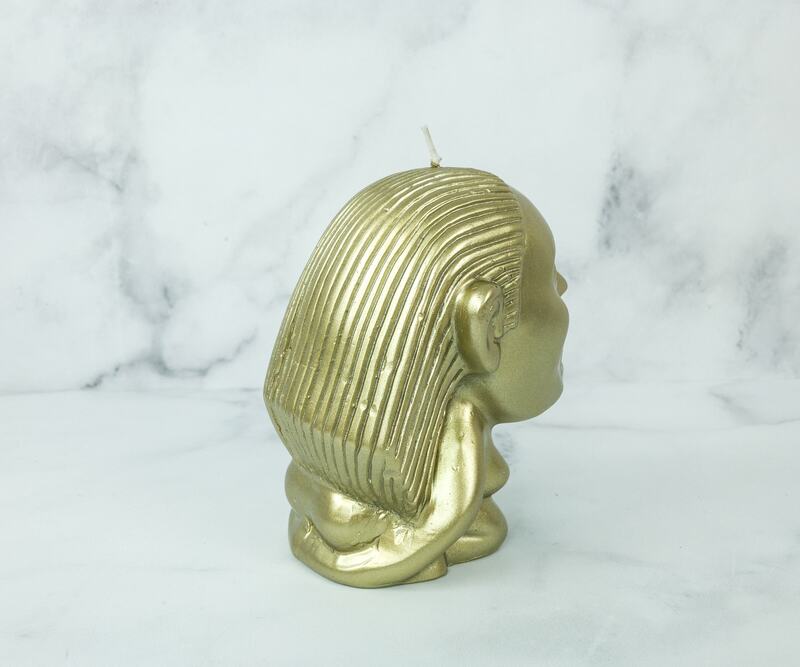 I always wanted a birthing fertility candle. 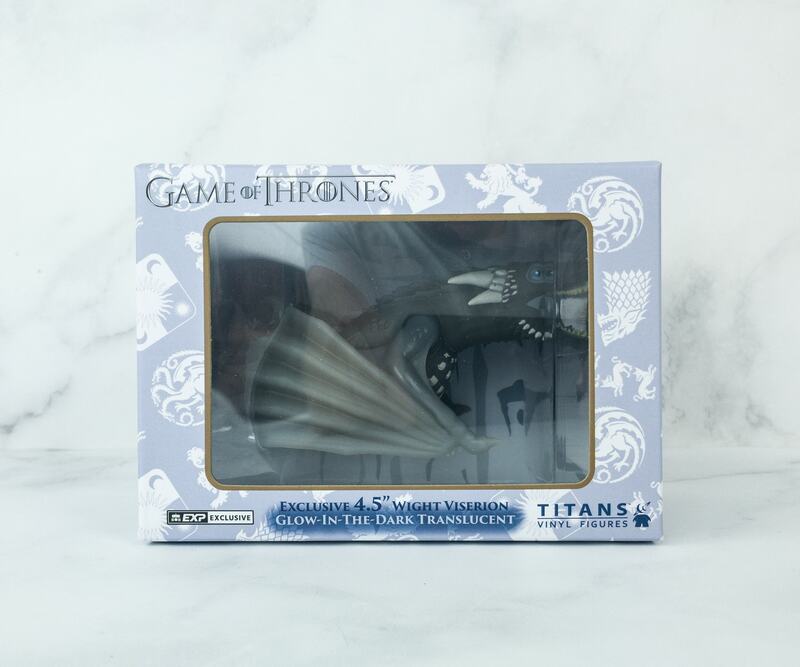 Game of Thrones Titan Wight Viserion Vinyl Figure. 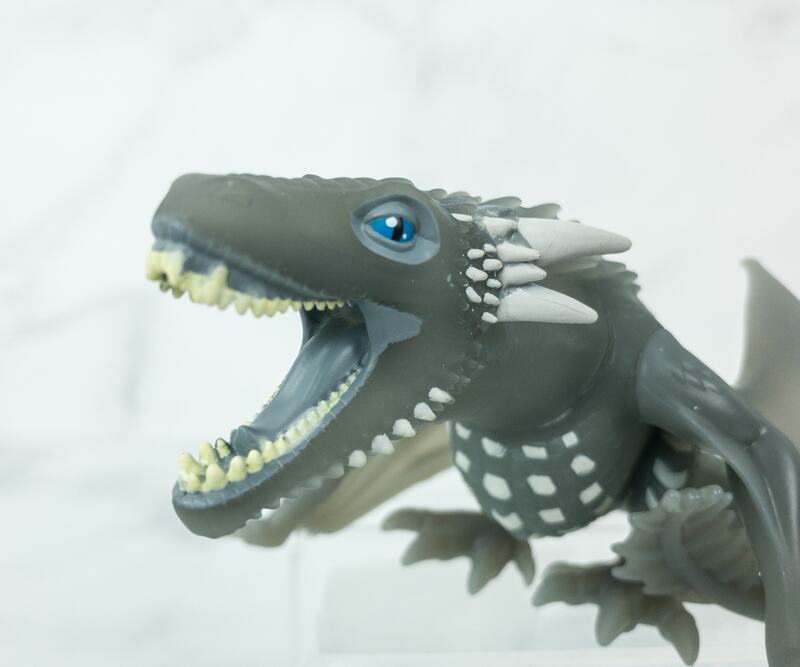 GOT fans will definitely love the inclusion of this vinyl figure! 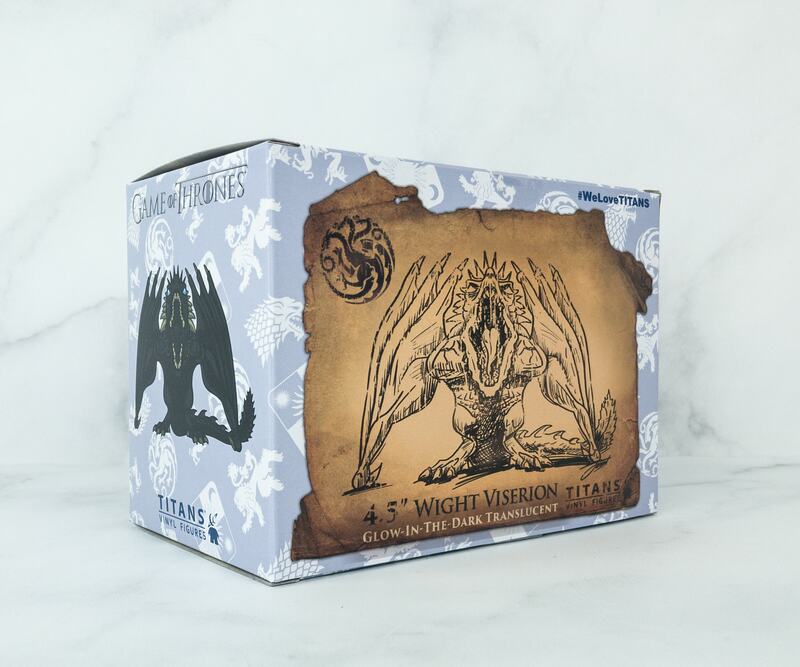 And I get really excited for the last season when I see GOT-related items! Also, spoiler alert if you haven’t seen season 7. 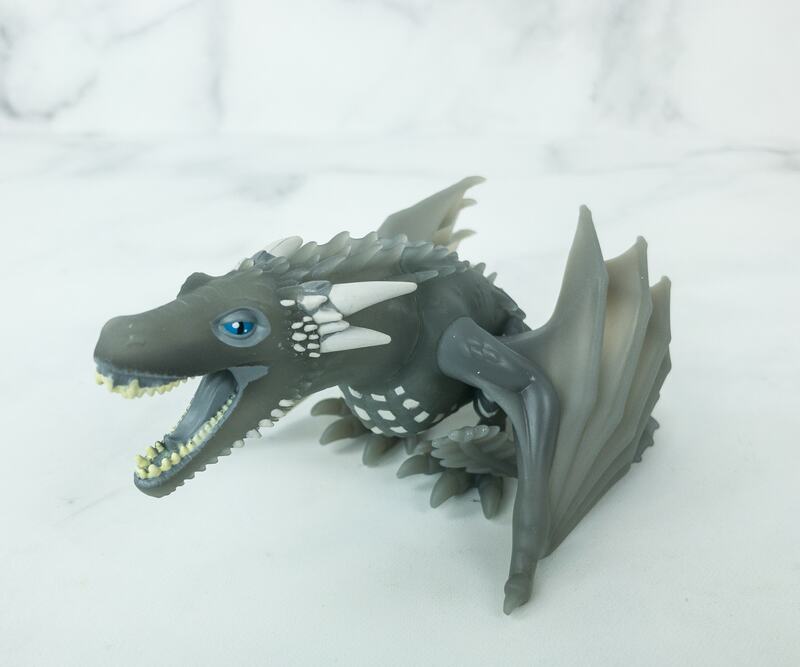 The figure for this month is the ice dragon Viserion, one of the three dragons that were born in the wastelands beyond Lhazar. On the earlier seasons, the majority of his scales were gold with cream-colored markings under his neck and tail, and white horns and spine. 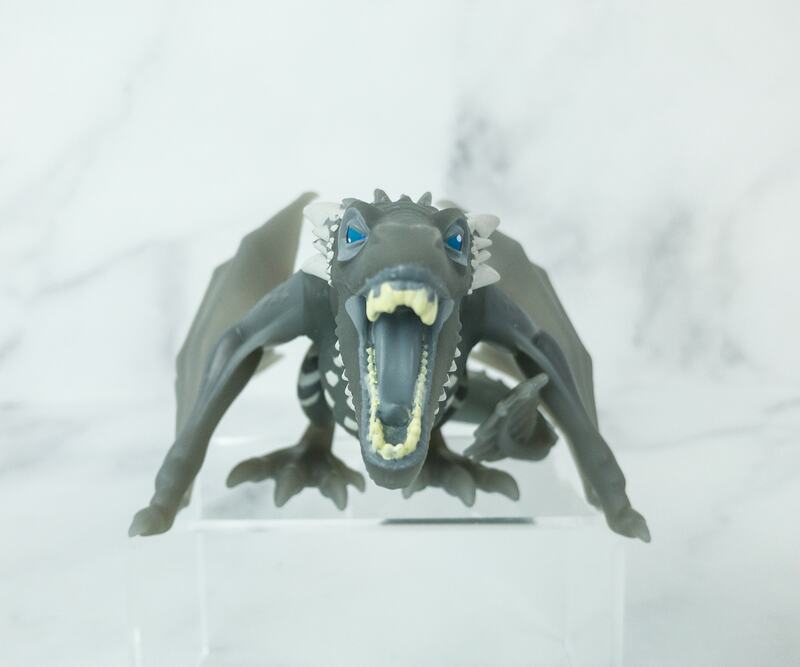 However, after becoming an ice dragon, his scales lost its gold color and appears more deathly blue, and his horns turned like white icicles. Also, his wings are torn and tattered in several places. He turned into this state as a reaction to the Night King’s magic. Viserion died at the hands of the Night King, and later on, was also revived by him, raising him as a wight. Also, as an ice dragon, he is different from the ones of legend as he breathed blue fire that is capable of melting a wall. 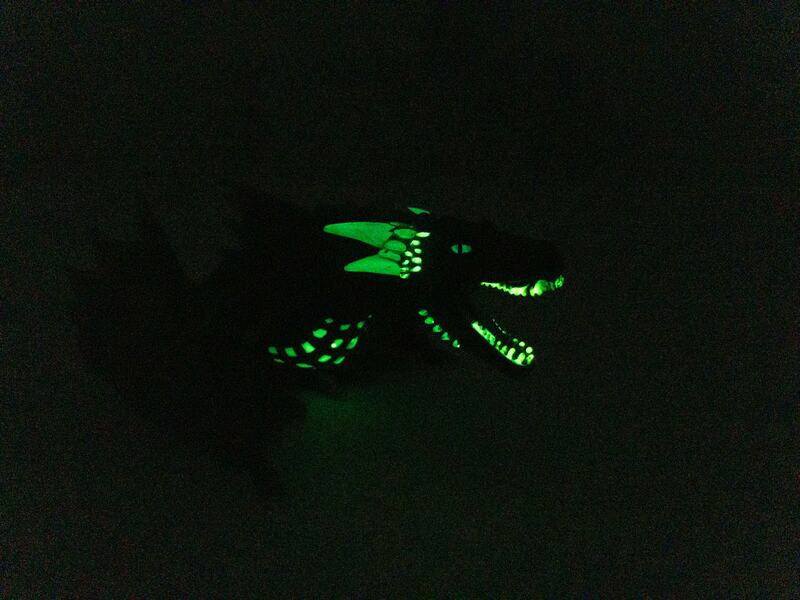 The white specks on the figure are the parts that glow in the dark! He looks scary yet majestic when I turn the lights off! 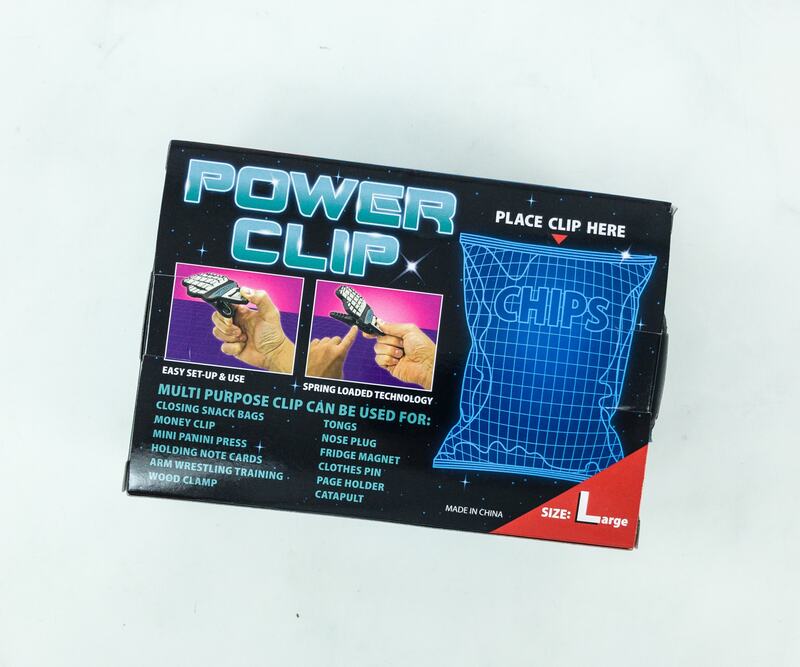 Power Clip Chip Clip. When I open up a bag of chips and later decided on that I can’t finish it all off, it’s really a hassle for me to find a way to seal it again so that I won’t lose its freshness. This is really saving me the hassle of keeping my chips fresh and crunchy! 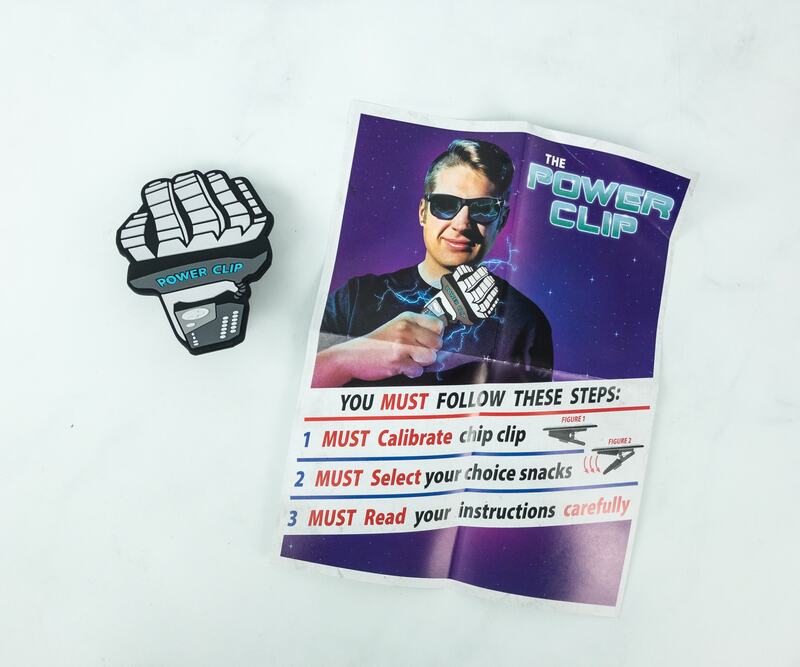 The power clip also came with an instruction leaflet! 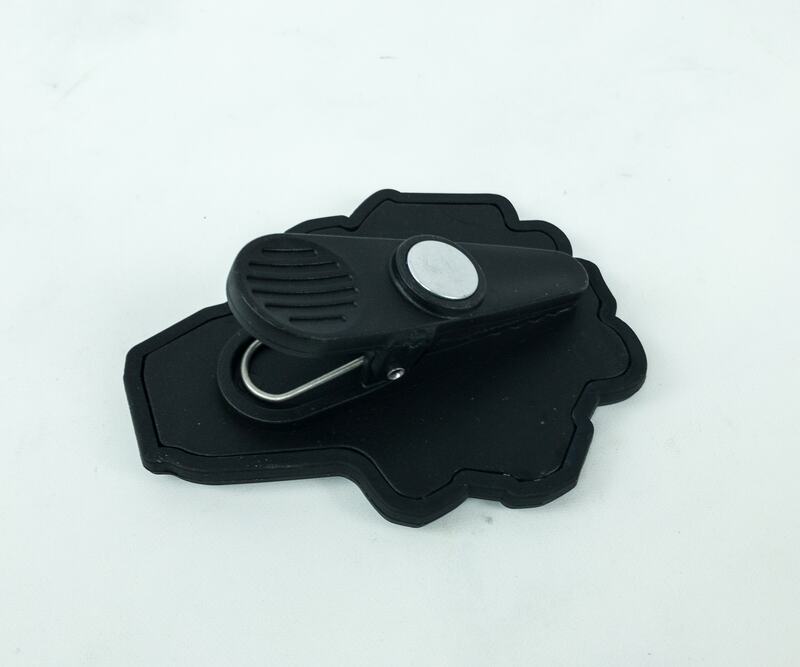 Aside from closing snack bags, the clip can also serve a lot of other functions: as a money clip, a panini press, a ref magnet (as you can see, there’s a tiny magnet on the clip), a clothespin, and a lot more! 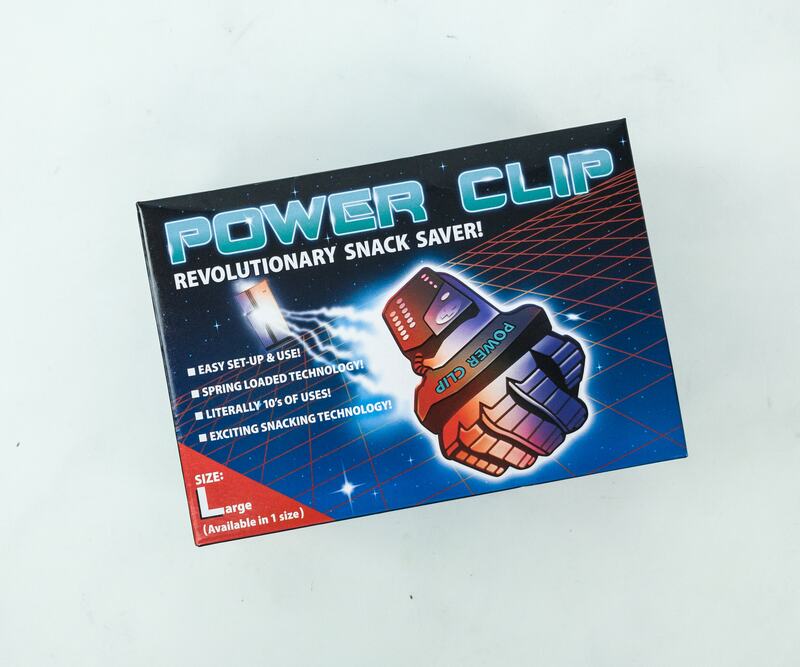 Ok ok, it’s just a chip clip – but a great one! It’s available in just one size which is large, and the design is cool too! 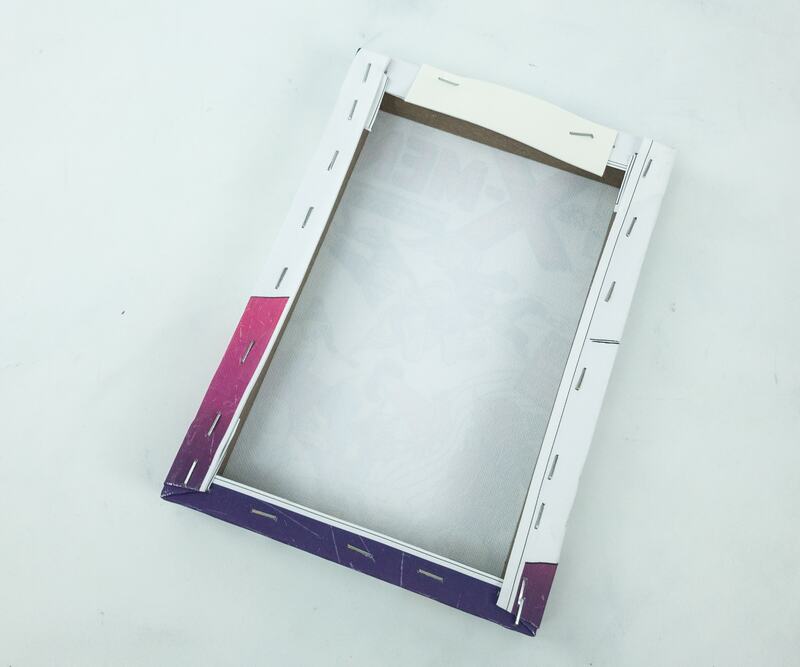 It shows how it will powerfully hold your snack bag and keep the contents protected inside! 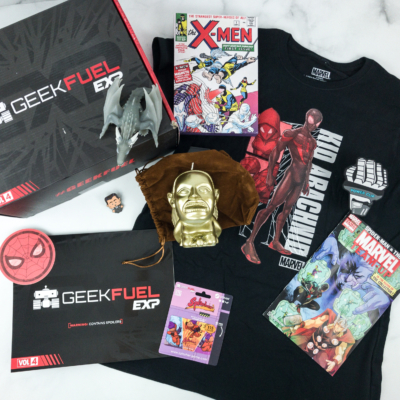 This is one of the best geek boxes around! As always, I am happy with the box contents. The artwork is great and the canvas art deserves a spot on my wall. Other things are really useful like the power clip. 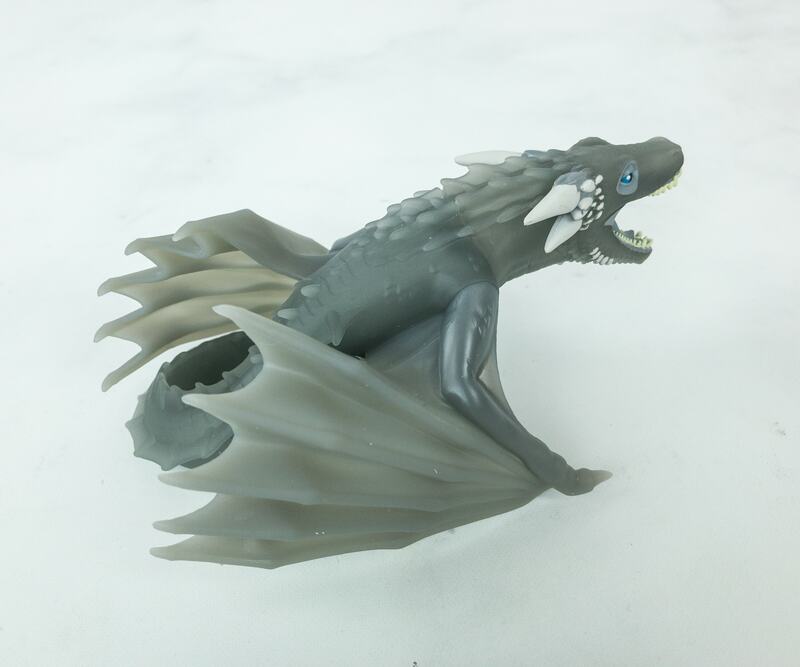 The GOT figure is cool as it features one of the dragons that turned into a wight and it glows in the dark too. 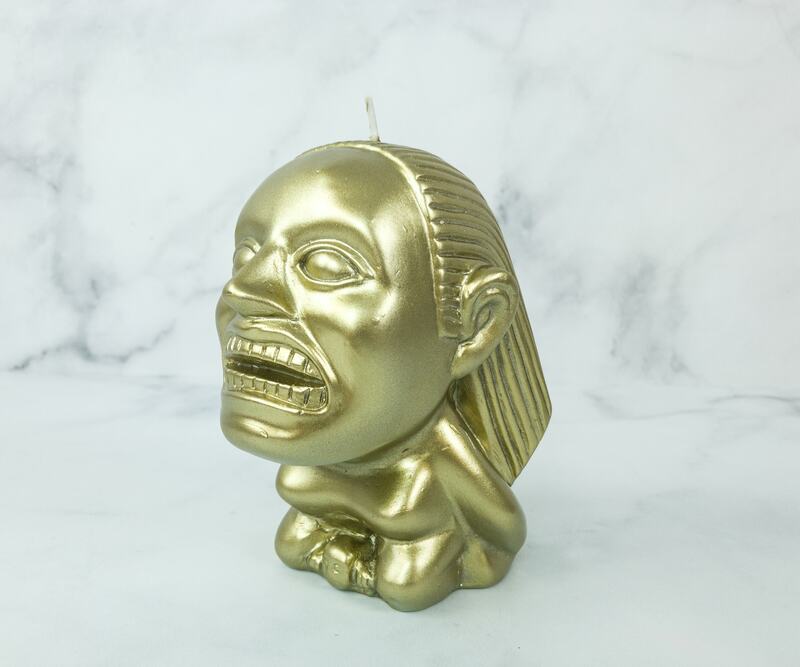 The Fertility idol is also another great item. I just don’t think I will light it up, I’ll just use it as a decoration. I like everything, but if I have to choose a favorite, it’s probably the Kid Arachnid shirt. I like its awesome and unique design, plus its great fit! 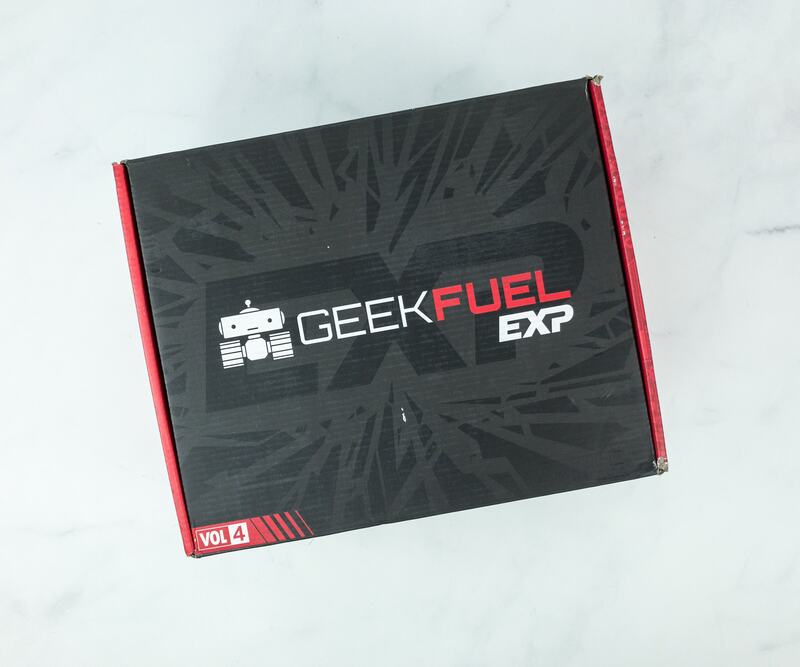 Geek Fuel EXP is always a fun box for me, and I definitely love geeking out with each box they send me! 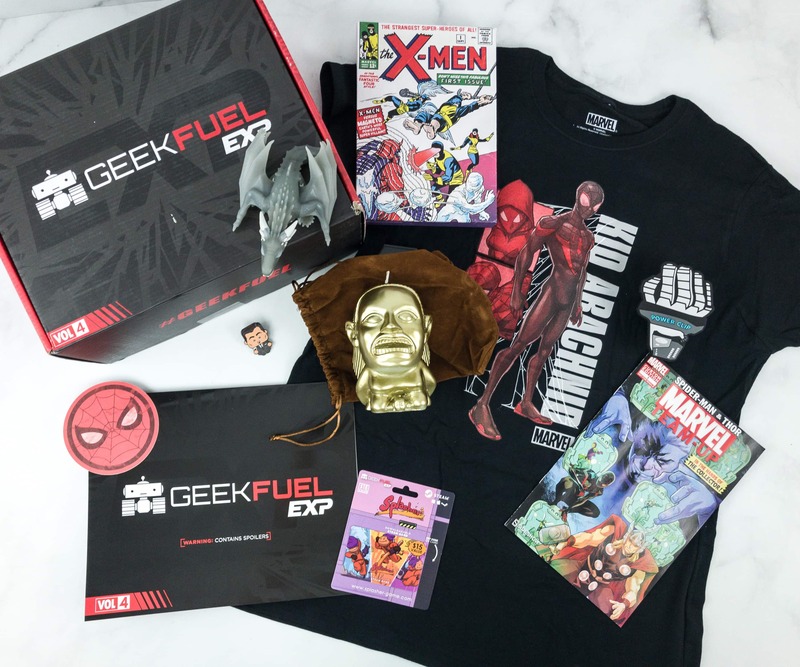 Each quarter, your Geek Fuel EXP box will be filled to the brim with even more limited-edition collectibles, t-shirts, figures, hoodies and art from all your favorite franchises like Marvel, DC and Star Wars! 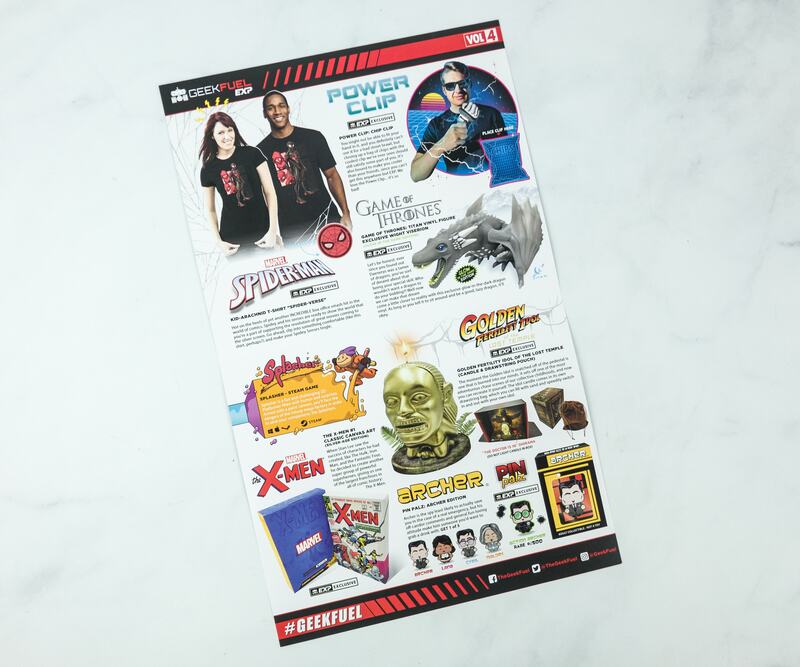 You’ll get even more exclusives to make your home, office, secret lair and life in general a whole lot better, with over $100 VALUE in every box, guaranteed.